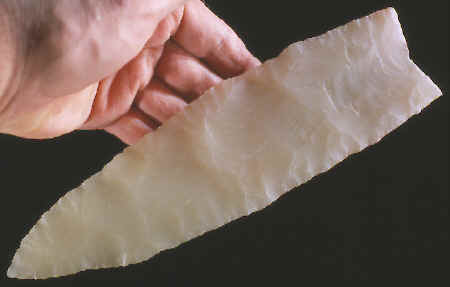 This is a cast of the largest Clovis point found during the excavation of the East Wenatchee Clovis site in Douglas County, Washington. It was found by Dr. Richard Michael Gramly in October of 1990. There were 60 Clovis artifacts found on this site, 14 of which were large Clovis points. All the artifacts were placed in a shallow pit, evidently as a cache. This Clovis point has been resharpened probably at least two or more times. It was made of a translucent clear to white agate. This picture show the patinated site of the largest Clovis point found on the East Wenatchee Clovis site. It measures 9 1/8 inches (23.2 cm) long and is made of translucent agate. One of the most spectacular archaeological discoveries ever made in the study of Early Paleo bone and stone artifacts occurred near East Wenatchee, Washington in 1987. The site is located in an apple orchard near the Columbia River in central Washington. The initial find was made by workers who were digging a ditch for an irrigation pipe line. 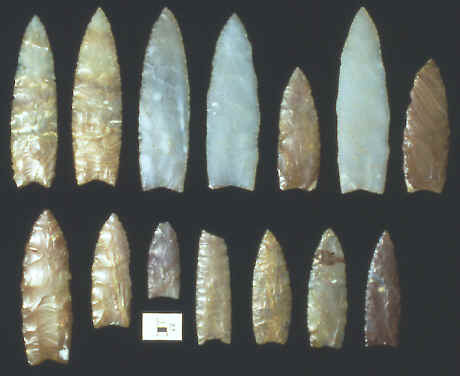 This picture shows all the Clovis points that were found during the excavation of the East Wenatchee Clovis site. They are made of banded and variegated agates from local outcrops. The longest point in this group measures 9 1/8 inches (23.2 cm) long. Until the East Wenatchee Clovis site was discovered the northwest was an area practically unknown for any significant Clovis discoveries. Clovis sites can be divided into four basic types. They are camp sites with little or no stone tool manufacturing, camp sites that were near a raw material source that produced new stone tools and large waste flakes, kill sites and cache sites. By far the rarest of these are the kill and cache sites. Kill sites are always associated with extinct animals such as mammoths, mastodons, etc. Cache sites have produced some of the best examples of Clovis artifacts discovered so far.